With over 35 years of experience, the Lexicon name is among top creators of reverb and processing equipment in the business, ensuring the finest quality effects not usually found in a console at this price level. The Effects section fits neatly into the mixer's compact framework, with 2 stereo channels and an effects-send on each channel. There are 32 effects to choose from with a tap tempo function, 3 effects parameter controls, and a user effects setting store facility. An effects channel level clip LED and Mute function give the user even more flexibility. 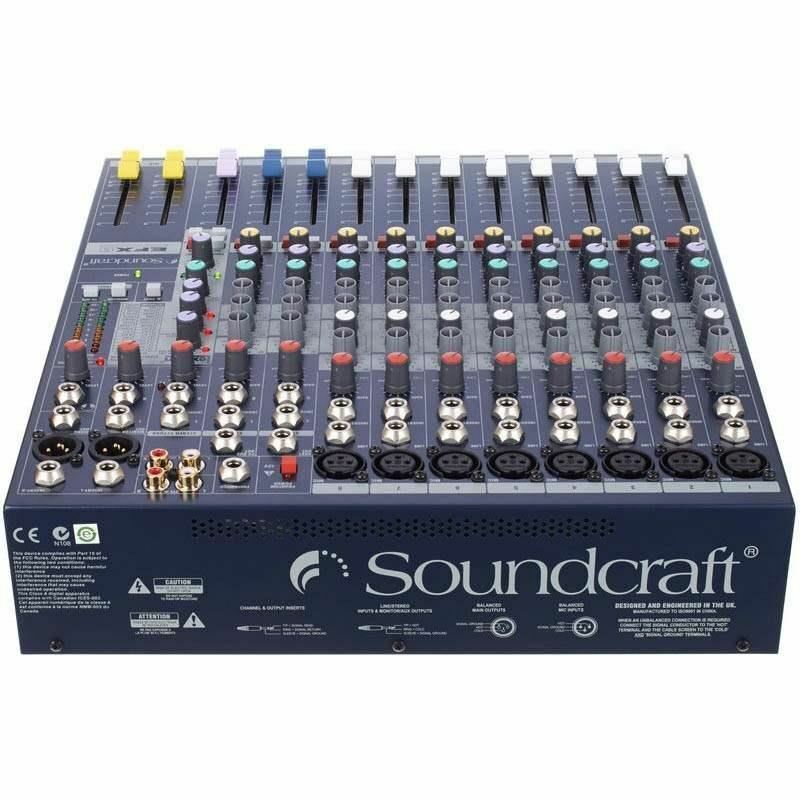 The emphasis with the Soundcraft EFX is very firmly on quality build and audio performance, with an easy-to-understand control surface in line with the Soundcraft professional range. The Soundcraft EFX uses the highly transparent GB30 Mic amp (designed by Graham Blyth for the company's 30th anniversary, and also used on the larger LX7ii and GB Series professional consoles). 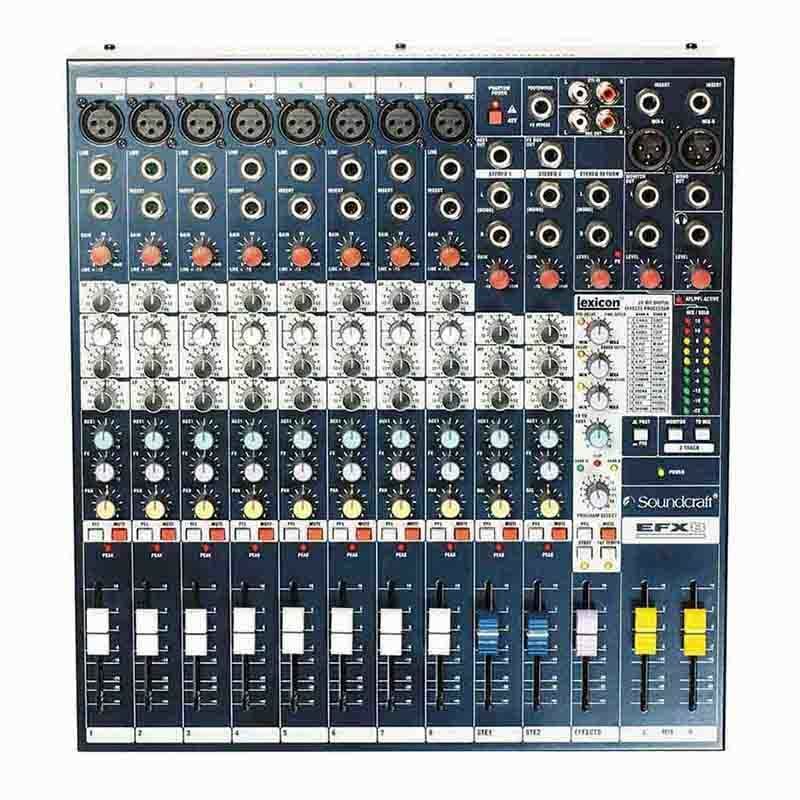 The Soundcraft EFX also offers all the features of the Soundcraft EPM, most notably a configurable aux send, XLR and 1/4" metal jack connector sockets, RCA phono stereo playback inputs and record outputs, a 3-band EQ with a swept mid on the mono inputs, a 3-band EQ on the 2 stereo inputs, TRS insert sockets, inserts on all mono inputs, ten-segment LED output metering and a headphone output. Yamaha DXS XLF Subwoofer Aktif Seperti model DZR, subwoofer DXS XLF juga digerakkan oleh prosesor DSP daya tinggi 96kHz dan memanfaatkan EQ dinamis. Yamaha DXS XLF menghasilkan end-end yang lebih rendah dari model sebelumnya dan Yamaha DXS XLF memberikan daya 1600W max dengan 36dB SPL dan rentang f..
Yamaha MGP12X Analog MixerKetika berbicara mengenai Audio Engineering dan Sound Reinforcement, tak ada yang dapat mengalahkan kedalaman dan musikalitas dari suara analog. Dengan menggabungkan terknologi digital terkini pada proses pengembangan peralatan analog profesionalnya, seri MGP ini adalah lan..
Peavey PV 231EQ Graphic EqualizerThe PV® 231EQ dual 31-band 2/3 octave graphic EQ brings quality features and low pricing together. Select between 6 dB or 12 dB cut or boost over frequencies ranging from 20 Hz to 20 kHz. Low cut filter switch with status LED helps remove rumble from open mics while ..